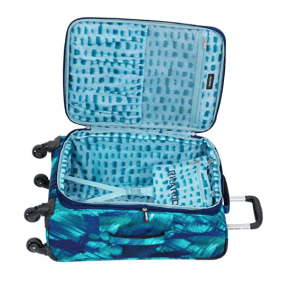 Ricardo Beverly Hills 744-29-400 is an imported brand new release luggage with a modern design and in four different sizes of underseat carry-on 16, carry-on 21, 25 and 29 inches. The 16” and 21” can be used as cabin bags to be taken on the plane with you and the 16” will fit under the seat in front of you comfortably. There aren’t many reviews online yet for us to be able to comment on the average rating. Each bag has a sturdy exterior material that is resistant to weather conditions, abrasions and impact. You have the metal telescoping handle that locks at three points, side and top carry handles and a bottom grip. It has four inline wheels that roll smoothly and effortlessly by holding the trolley handle. You’ll find zipped pockets on the side and the front and there is even a tablet pocket. There is a pass-through trolley strap as well on the small 16-inch bag. Inside you’ll find a spacious toiletries pouch that is water-resistant. And you can fit in plenty of stuff in this small cabin bag. It is designed in the US and manufactured abroad and the warranty is 10 years limited by the company- Ricardo Beverly Hills. The 16” bag weighs 5 pounds and measures 15.5H x 13W x 7.5D inches (18H x 13.5W x 8.5D inches with the wheels and handles). Then you have the standard 21” carry-on suitcase that you can put in the overhead locker above you. It weighs 6.2 pounds and measures 21H x 15W x 7.5D inches (24.5H x 16.5W x 10D inches ). It can be expanded by another 2 inches through the expansion zipper in the middle. This one has the vegan-leather pulls on the lockable zippers. Inside you have the elastic cross straps to keep your clothes and other items in place, a snap-out toiletries pocket, two elastic shoe pockets and the coordinating lining. There are the double skid rails and corner protectors for smooth and quiet rolling. The 25” and 29” suitcases share pretty much the same specs. The 25” medium size suitcase weighs 7.3 pounds with the measurements of 25H x 18W x 8.5D inches and 29H x 19W x 11.5D inches overall. 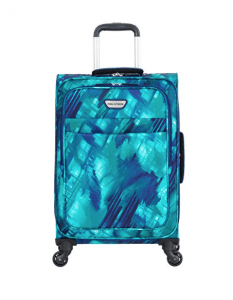 The largest 29” suitcase weighs 8.6 pounds and measures 29H x 20W x 9.5D inches and 32.5H x 20.5W x 12.5D inches overall including the handles and the wheels. Please double check the accurate dimensions with the seller as the two sets of figures can be confusing for some. It may turn out to be bigger than what you may expect. Overall they offer good value at fair prices and they should hold up well over your frequent trips.